JAXA Astronaut Kimiya Yui, a Flight Engineer for Expedition 44 and 45 aboard the ISS has been assigned to manipulate the Space Station Remote Manipulator System (SSRMS) for the operation of capturing KOUNOTORI5. 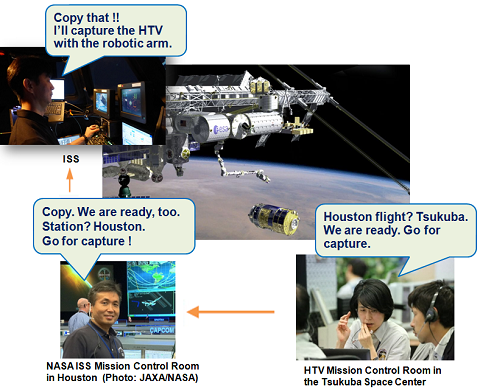 It is the first time for Japanese astronauts to capture the HTV. JAXA Astronaut Koichi Wakata will serve as lead Capsule Communicator (CAPCOM) for the HTV5 mission at the NASA Mission Control Center (MCC). By improving the way of loading of cargo, the HTV’s loading capacity has gradually been increased. The amount of loadable cargo of KOUNOTORI5 has been increased up to 242 Cargo Transfer Bags CTBs) as compared to 208 CTBs during HTV1 mission, which is the increase of 34 bags and about 15%. This allows the HTV to accommodate more packages such as water and system parts. Living experiment samples, space foods that need to keep their freshness. Urgent resupply and/or replacement of the contents of cargo due to the sudden failure of parts or hardware on the ISS. To meet new needs, KOUNOTORI5 delivers new experiment devices including the Mouse Habitat Unit (MHU), Electrostatic Levitation Furnace (ELF), and the CALorimetric Electron Telescope (CALET). KOUNOTORI5 also delivers the Multi-purpose Small Payload Rack2 (MSPR-2), CubeSats, and the Exposed Experiment Handrail Attachment Mechanism (ExHAM), etc. and provides various experiment opportunities to increase the use of space environment. The HTV contributes not only delivering cargo to the ISS, but is used to accumulate technology helpful for the development of spacecrafts in our nation. The KOUNOTORI Advanced SPace Environment Research equipment(KASPER) is attached to the surface body of KOUNOTORI5. It is important for the safe ISS operations to clarify how the HTV’s electric potential changes when it is berthed to the ISS and how it affects the electric potential of the ISS. 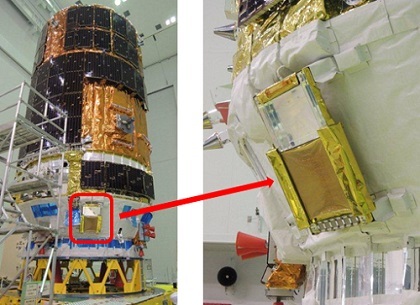 For this reason, a surface potential sensor called “ATOTIE-mini” (Advanced Technology On-orbit Test Instrument for space Environment - mini) was installed to the surface body of KOUNOTORI4 to collect the data. On KOUNOTORI5, an upgraded sensor with more functions, the KOUNOTORI Advanced SPace Environment Research equipment (KASPER) is installed. In addition to the surface potential sensor that was also installed to KOUNOTORI4, KASPER is equipped with plasma current measurement equipment and two kinds of debris detectors: Chiba-koudai Debris Monitor (CDM) and the Space Debris Monitor (SDM).